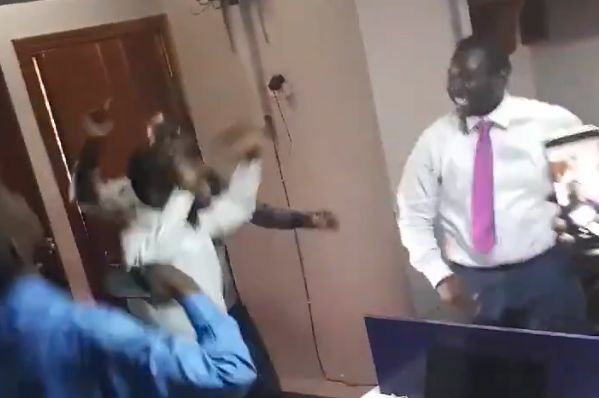 Ghanaian Manchester United fans celebrated news of José Mourinho’s sacking by dancing around their office, cheering and singing. Scenes of elation lit up the workplace as word reached them of the managerial situation at Old Trafford. The Portuguese was given his marching orders on Tuesday following Sunday’s dismal performance during the 3-1 defeat to Liverpool at Anfield. It’s a result that left the Red Devils nineteen points behind Jürgen Klopp’s table-toppers with the Premier League season yet to reach its halfway stage. Michael Carrick and Kieran McKenna will take training today, with a new caretaker boss to be appointed to take them through to the end of the season. Zinedine Zidane, Diego Simeone and Mauricio Pochettino have all been linked with the vacant hot seat.